Carne asada burrito from Roberto's in San Diego. 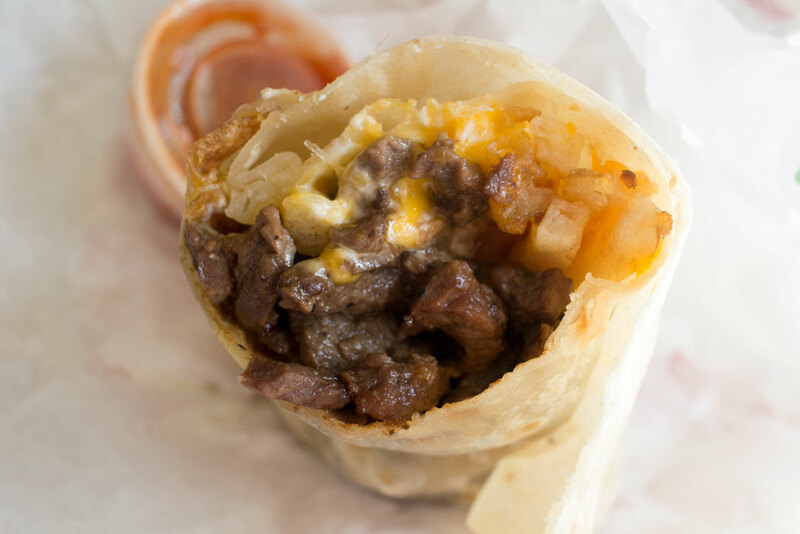 The California Burrito is magic, a giant flour tortilla stuffed with carne asada, salsa, cheese, sour cream, and french fries. It's so simple yet so addicting and the ability to remove a hangover as well as fight hunger has been proven time and time again. The history is vague but most people believe that it was invented in the 1980's at Roberto's Taco Shop. Or maybe not. Maybe it was Jiliberto's. Or Rigibertos? Santana's? It doesn't matter, what matters is that if you are here in San Diego you need to try this burrito because nothing except the Fish Taco screams San Diego like a California Burrito. Fast food faker California Burrito - is nothing sacred? Don't fall for a fast food or chain Mex imposter! Look at the real California Burrito on top and pretend this is one of those puzzle games you played as a kid where you have to figure out what's different - Hmmmm, let's see, the fast food burrito seems to glow in the dark for one thing. The tortilla looks like it will have the texture of cardboard versus the chewy freshness of a real taco shop tortilla. And the guacamole looks - wait! THERE'S NO GUAC ON A CALIFORNIA BURRITO! GEEZ, IDIOTS! OK, some very credible taco shops do put guac on them but it's not on mine and if it was it's not supposed to be florescent green. Bite into this California Burrito when you are in San Diego. See how moist and succulent the meat is? Calm down everyone (I'm talking to myself). This is the California Burrito from Roberto's - perfectly cooked carne asada, a fresh tortilla that did not come from a factory, this is legit, the real deal. Get yourself to a taco shop, preferably one where English is the second language and see what I mean. The California Burrito was invented in San Diego and is right up there with the fish taco as our top culinary contribution to the world.